“The Real Escape Room: SF Vol. 1 – Escape from the Mysterious Room” opened on Dec. 14 and will run periodically through 2013. Multiple game sessions will take place most weekends inside New People’s third-floor Superfrog Gallery space. New People is located in San Francisco’s Japantown at 1746 Post St. (near Webster Street). More information at www.newpeopleworld.com. “The Real Escape Room” is the newly installed, semi-permanent home for the latest version of “The Real Escape Game,” an inventive puzzle-solving interactive event, originally created in Japan, that requires players to cooperate and use their intuition and detective skills to solve multiple mysteries within a limited time. 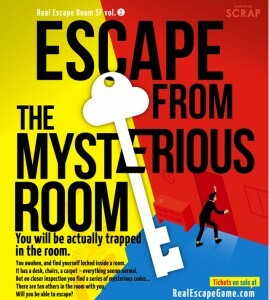 In “Escape from the Mysterious Room,” players find themselves locked inside a seemingly ordinary room. It has a desk, chairs, a carpet – everything seems normal. But on closer inspection, players will find a series of mysterious codes and puzzles that must be solved in order to find a hidden key to escape. The maximum capacity of participants for each game will be limited to 11 people. Game duration is around 1.5 hours (including introductions and a solution walk-through). Game times: Fridays at 6:30 and 8:30 p.m.; Saturdays at 11a.m. and 1, 3, 5 and 7 p.m.; Sundays at 11 a.m. and 1, 3 and 5 p.m.
Tickets are $28 in advance, $33 at the door. Tickets and additional information are available at http://realescapegame.com/rersf1. SCRAP Co. (www.scrapmagazine.com), based in Kyoto, produces the free magazine SCRAP and the “Real Escape Game” (REG), which has been played by over 200,000 people in Japan, China, Taiwan, Singapore and the U.S. SCRAP Entertainment Inc. (http://RealEscapeGame.com), based in San Francisco, is a U.S. division of Scrap Co. and produces REG in the U.S.